Alternatively, please fill out the contact form opposite and we will get in touch with you as soon as possible. If you have any other queries, or simply need some advice regarding your symptoms or an injury, please do get in touch and we will be happy to chat through your concerns. For pilates and other treatments, please contact us to find out more. *Clients can either fund their own treatments with cheque or cash or can claim from their own private health care insurance. We are registered with all the major companies – BUPA, AXA, PPP, Aviva, Cigna and many more. It is worth checking with your insurer before you come for treatment. What conditions can physiotherapy help? Our team is skilled at treating any pain or injury that affects a bone, joint, muscle, tendon, ligament or nerve. If you have a problem that you think can be treated by physiotherapy you can either ask your doctor or talk to us direct. We will offer you an appointment as soon as we can, usually within 24 hours or you may be offered a cancellation slot the same or next day. Your first visit will involve a full assessment of your injury or pain. For most treatments you will have to remove some of your clothes. We will examine you and ask you detailed questions on how it affects you. This enables us to make a diagnosis and start your treatment. You might be given some specific exercises and you will be advised on important self care. We will also advise you on the number of treatments you are likely to require to bring you back to good health, which vary according to your problem and condition. In most cases we also advise your doctor of what your condition and treatment involves. It is generally best to wear loose fitting and comfortable clothing to your appointment. Some treatments may require you to undress to your underwear to enable the therapist to clearly access to the area needing treatment. Does my doctor need to refer me for an appointment? No, you can book with us direct if you are paying for your treatment. If you wish to claim from your private health insurance then ask them if your doctor or consultant needs to refer you before your first visit. Your first consultation will be 45 minutes to 1 hour and follow up treatments usually last for approximately 30 minutes. Our reception team will be very happy to provide you with details of all our very competitive costs for the range of treatments and classes we offer. Clients can either fund their own treatments with cheque, cash, or card payment. Or they can claim from their own private health care insurance. We are registered with all the major companies – BUPA, AXA, PPP, Aviva, Cigna and many more. It is worth checking with your insurer before you come for treatment. We have eight parking spaces in Highpoint which are assigned to The Partnership. These are shown on the map in pink. There are also delegated visitor spaces, which are shown in blue. 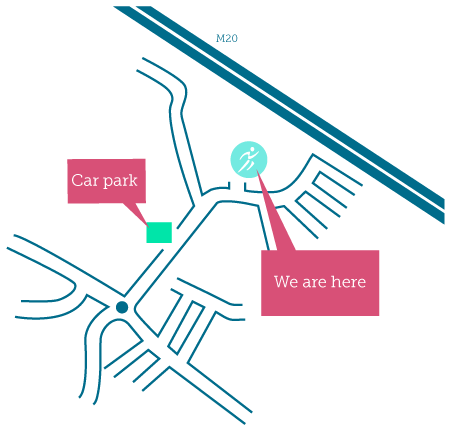 All other spaces are allocated to the other businesses in Highpoint. When space is available, parking is free of charge. The three spaces marked number 10 directly in front of the clinic are for the use of physiotherapy patients only. The remaining marked spaces can be for physiotherapy or Pilates clients. Anyone using a number 10 space should collect a parking permit from reception to display in the windscreen. Visitor spaces do not require a parking permit and can be used for up to two hours. There are wardens on patrol and anyone in a number 10 space without a valid permit will be fined. You should only use number 10 spaces or visitor spaces or you may incur a fine. 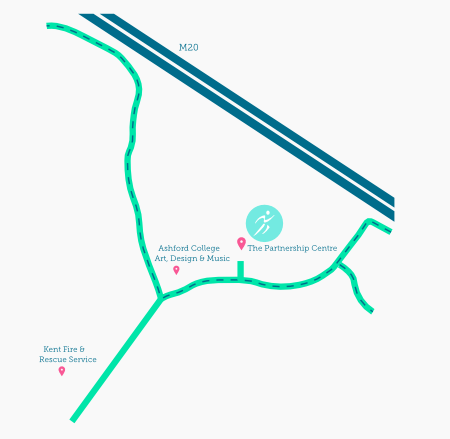 Parking is also available in the Henwood car park. There is a minimum charge of 40p for 30 minutes. Thereafter in 5p increments. 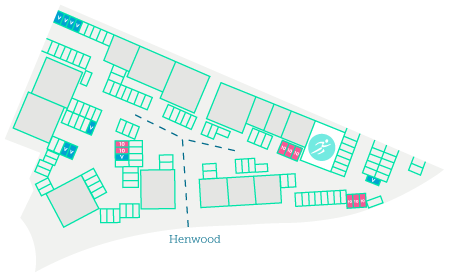 There is free on road parking at various places around Henwood as shown on the map in blue.